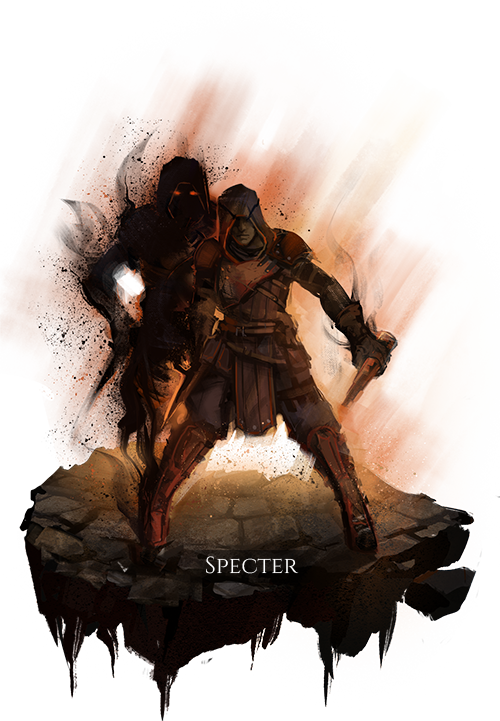 The Specters possess a greater mastery of fear than the scouts of the other Realms. While it is not a necessary component, Specters often wear a special face-mask when not “working” at their chosen profession. The origin of Specters is a bit of a mystery to most Arthurians; the Specters like to keep it that way. The world’s shadows are our home. Encumbrance from equipment is greatly increased. The user’s body loses blood over time while their spectral body is active. The rate of blood loss accelerates over time, with the acceleration rate determined by the distance between the user’s body and their spectral body. The user’s spectral body takes greatly reduced damage from physical attacks and quickly regenerates health. Increases movement speed progressively over time while not taking damage, up to a moderate limit. Transitions the user to and from their spectral body. If the spectral body is not already present and alive, it is re-summoned. The user’s spectral body gains greatly increased camouflage and movement speed, and may perform Specter abilities. Places a shadow debuff on the target that siphons blood from the target after a brief period of time, transferring blood to the user’s body. Marks an enemy target as sighted for a long duration, and greatly reduces the effects of Cross Fade. Places a shadow debuff on a deployable object for a long duration. If an enemy approaches and remains within close proximity to the affected object for a brief period of time, this debuff causes damage to the object and any nearby enemies. When the spectral body is killed, it inflicts a high amount of panic to enemies within a large area, with a duration based on the remaining blood of the user’s body. Any enemies who reach their maximum panic rating while under the effects of Haunting Fear are affected by a shadow debuff that greatly reduces their movement speed, as well as increasing their ability preparation and recovery times.